Tracy police Lt. Jeremy Watney (left) and Sgt. Luis Mejia brief the press on the search for Sandra Cantu at Saturday morning’s press conference. 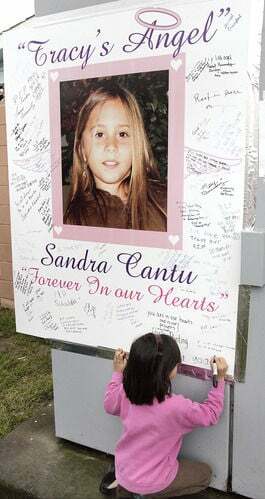 Sandra Cantu would have been 18 this year. She would have been able to vote, able to graduate from high school. Instead, she lies interred at Tracy Mausoleum and her killer is serving a life sentence. Cantu was 8 years old on March 27, 2009, when she disappeared from the home she shared with her mother, Maria Chavez, and her siblings and grandparents at Orchard Estates Mobile Home Park on Clover Road. It was a Friday. She was reported as missing just before 8 p.m., and within 24 hours Tracy police officers, members of Volunteers in Police Services and the Community Emergency Response Team, firefighters, and members of the FBI, highway patrol, and San Joaquin and Stanislaus county sheriff’s departments all joined in a fruitless search for the Jacobson Elementary School second-grader. What they didn’t know then and wouldn’t confirm for two weeks was that Melissa Chantel Huckaby, a 28-year-old former Sunday school teacher and granddaughter of the pastor at Clover Road Baptist Church, had drugged Cantu, killed her, stuffed her body in a suitcase and dropped the piece of luggage into a drainage pond north of town. By all accounts, it was a tortured time for many in Tracy during the search for the little girl. Dozens of local volunteers joined 230 search-and-rescue professionals from 16 different agencies in scouring the community for any signs of her. The U.S. Coast Guard mobilized a C-130 military plane equipped with state-of-the-art cameras to search the Tracy area from the air. On April 6, farmworkers drained the pond and discovered the large black suitcase. Officers took the case to the county coroner’s office, where it was opened and Cantu’s remains discovered inside. The investigation, and the public’s attention, turned immediately into a manhunt. Men who were around Cantu in life and showed her affection were suspected by residents, while police investigators quietly worked to get enough evidence for an arrest. The suitcase belonged to Huckaby, who also lived at Orchard Estates Mobile Home Park. She had told people early on that it was stolen the day Cantu disappeared after she inadvertently left it outside her mobile home. Cantu was last seen at her home playing with Huckaby’s daughter. Then, on April 10, Huckaby gave a telephone interview to Tracy Press reporter Jennifer Wadsworth that was published the following day. That interview proved to be a key piece of evidence for investigators and prosecutors. She said she left it outside her trailer when she went to look for her phone and keys and then forgot about it. She also told Wadsworth that Cantu had stopped at her home March 27 but left to go to another friend’s home when Huckaby wouldn’t allow her daughter to play because she had to pick up her toys. The night of April 10, following her interview with the Tracy Press, officers arrested Huckaby and charged her with Cantu’s murder. Evidence showed she had abused the 8-year-old with a rolling pin and then choked her to death at her grandfather’s church. She was seen coming and going from the church and near the pond where she dumped the suitcase. It turned out she had inserted herself into the investigation early on, giving a misspelled handwritten note that she claimed to have found to the authorities March 28. It read: “Cantu locked in stolin suitcase thrown in water onn Bacchetti Rd. & Whitehall Rd witness.” The handwriting, although disguised, matched Huckaby’s. Prosecutors said that anti-anxiety prescriptions found in Huckaby’s home had been used to drug Cantu and that investigators had listened in on the interview she gave the Tracy Press, courtesy of a court-approved wiretap, in which details she talked about differed from her interviews with detectives. Cantu’s disappearance and murder made national news and galvanized Tracy. More than 4,500 people turned out for a memorial for the little girl at West High School. Television news crews ringed the mausoleum to catch a glimpse of her funeral. In a plea deal in June 2010, Huckaby avoided the death penalty and confessed to the murder. She is serving a life sentence in prison. Cantu’s killing left lasting marks on Tracy. In the wake of her death, volunteers dedicated a tree and a new playground in her name at Jacobson Elementary School. Her cousin Janet Anderson began an annual event on Cantu’s birthday called Tracy Celebrates Children. In the years that Tracy Celebrates Children has taken place, hundreds of local kids have been fingerprinted and photographed to help rescuers in the event of another kidnapping. Local residents like Gina Schnabel, a friend of her father, raised thousands of dollars for nonprofits that combat violence against children.